The graph below shows the average daily spend of three categories of international visitors to New Zealand from 1997 to 2017. The line graph compares three types of traveller to New Zealand between 1997 and 2017 in terms of their average daily expenditure. It is noticeable that spending by these international visitors was at its highest between the years 2000 and 2003. Overall, business travellers spent the most per day, while people visiting friends or relatives spent the least. 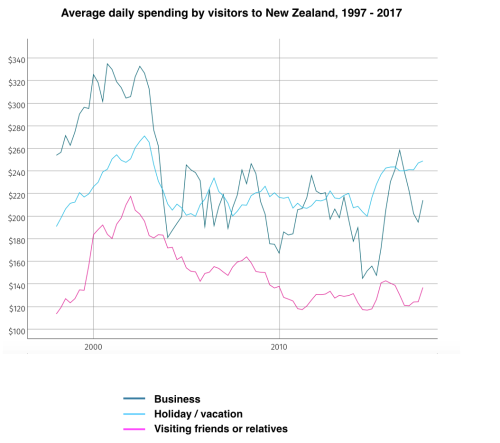 In 1997, business visitors to New Zealand spent an average of almost $260 per day, while holidaymakers spent around $190 and people visiting friends or relatives spent less than $120. Over the following five years, translation from Laokaoya website, spending by all three types of traveller increased dramatically, to peaks of around $330, $270 and $220. However, visitor spending suddenly fell again between 2003 and 2005. From 2005 to 2015, the daily expenditure of business travellers and tourists fluctuated around the $200 mark, whereas people visiting relations or friends spent roughly 60 to 80 dollars less per day. By 2017, daily spending had risen to approximately $250, $210 and $140 respectively for vacationers, business people and those visiting loved ones. 雅思备考之雅思口语part 3问题解析How is modern home design in your country different to that of the past?